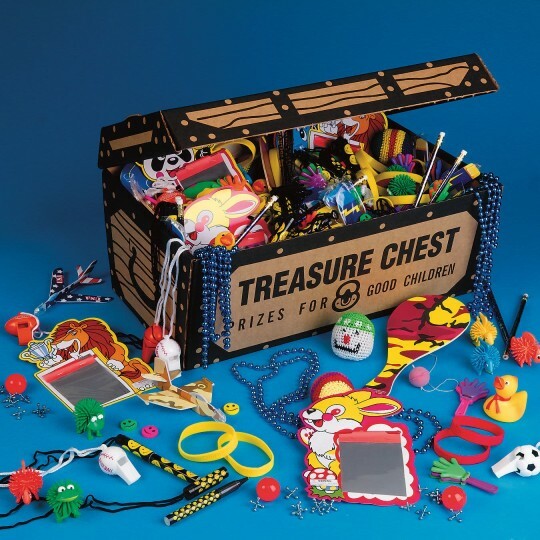 100 low-priced toys with treasure chest. Perfect for all the pirates in your group! Horns, planes, games, puzzles and more! These are great for our clients in which are special needs. They enjoy getting a prize when they win a game. We will continue to buy this product. This treasure box is great for bingo or for residents to choose from. It is a little on the expensive size. The disappointment was it does not fill the box as seen in the picture. But the contents were perfect otherwise. Merchant response: Thank you for your product review, and we are happy that your residents enjoy using it for Bingo. Please note that, as the description states, the photo depicts more than one kit used to fill the treasure chest. Great use for rewarding young children. I would but this again! I am employed by a summer camp and this was enjoyed by all at staff training. We pulled the treasure chest out when someone went above and beyond the call of duty and then had them sign it. They LOVED it and everyone could not wait until they got a chance to get a treasure. Highly recommend to anyone.